It is a process by which we implant in the dermal layer of the skin a small amount of pigment to create an illusion or enhancement where hair or colour is missing (as in eyebrows, eyeliner, lip liner and colour) allowing a person�s natural features to be enhanced so they can wake-up with definition. What are the advantages of permanent make-up? Permanent make-up is perfect for the person "on-the-go" who has little time to fuss with make-up, for the athlete who wants to look natural and those with oily skin whose make-up seems to disappear after a short time. Also, those allergic to conventional cosmetics or contact lens wearers may benefit from the application of permanent make-up. 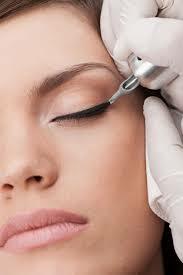 Permanent makeup lasts two to eighth years, or longer, depending on how you care for your skin. Cell turnover of skin renewal plays a role in how long your colour will last. Skin on the face changes faster than the rest of the body and that will determine the length in witch your make-up lasts. Anti-aging creams, sunlight and facial peels can shorten the effect. 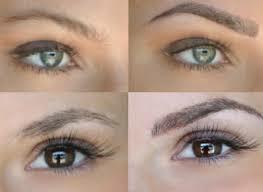 Create, reshape or extend the brows using a hair technique, so eyebrow pencils become a thing of the past. We choose the best colour and shape for your brows and then they are drawn on in pencil so you can see exactly what the final shape will be. 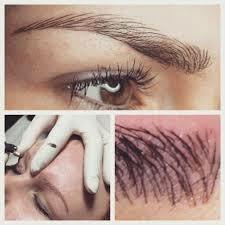 Permanent brows, done with a hairline stroke, can mimic the appearance of real hair. 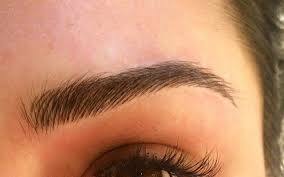 The brow is created around your natural hair pattern; there is no need to remove any hair you may have. If you have been penciling brows for years there is nothing to describe the freedom you are about to experience! Permanent lash enhancement is more flattering than topical eyeliner because it is placed within the lash line. Your lashes look naturally darker and thicker and you never have to worry about smudging. Aging brings a vague look created by loss of eyelashes; permanent liner restores a bright youthful spark to the eye. With sun exposure and premature aging our lips loses its colour as well as volume, leaving you with a thin and dull appearance to the lips. With lip colour application a colour is chosen that best suites your natural skin tone. What can I expect when coming for my treatment? With permanent make-up 2-3 treatments is required. On your first consultation the colour and shape is discussed into detail and the pigment is applied superficially before the actual treatment to give you a clear indication on how your make-up will look before applying it permanently. When you are satisfied with everything a local anesthetic is used to deaden the skin. After your first treatment the skin often forms a slight scabbing effect, which causes some of the colour to be lost. When the skin is healed within 3 weeks a second and third application will insure the perfect shape and colour depth. Less is best, says Lizelle Young who has experience in this art since 1999. When deciding on your application you must always remember that this is not a treatment that is easily reversible. Stick to something you are use to and keep it soft and natural. You can always apply more colour, but you can not take a dark colour away. With your artists recommendations in mind just remember that this procedure will be a highlight in your features for a long time, and now is not the time for a dramatic change. Keep in mind what you are use to and what looks natural and you will never look back.